I once lived, moved and breathed right smack in the heart of the biblical parable of the lost sheep, albeit contextualized for Colorado Springs, Colorado. Now, in these parts, at least in the city, we don’t herd many sheep; but we do have cliffs, frigid winter nights, and hungry predators. And we adore our animals, especially our dogs. It all started with a post on an online message board: Extremely shy greyhound lost for two weeks, sighted two days ago near Palmer Park where a mountain lion roams. A search party on Saturday morning. I knew, sure as I recognize the difference between lost and found, that our family was appointed to find that dog. My kids thought I was crazy, grumbling as I hurried them to throw on shoes and coats. My husband agreed, but he was kind enough not to say so. We commenced our search in a naturalized park. Wandering up a hill in a gully, peeking under bushes, peering out over forest stretching as far as we could see, our task loomed impossibly. Not only were we hunting for a lost dog, but a terrified creature who didn’t want to be found. Surely, we were caught in a needle-in-a-haystack riddle. The youngest kids’ complaints ratcheted up a notch. But somewhere out there, a skinny defenseless greyhound didn’t stand a chance with a mountain lion on the prowl and cold weather impending. We couldn’t give up. I received a text alert: someone spotted the dog in a nearby neighborhood! We tore down the hill, agreeing as we ran that the kids would set out on foot with our oldest teenage son while my husband and I combed the area by car. Why did I feel so compelled to get involved that day? The only reasonable explanation I can find is that I know a God obsessed with finding anything lost. I’ve witnessed his compulsion at the most extreme, like in the year 2000 when a fragile newborn lay abandoned in a Nairobi slum street. No one saw that baby except God, but He ensured a passerby noticed the barely perceptible movement and discovered the living being inside. Then, He made certain a couple halfway around the world in Colorado, two people who had never even set foot in Africa, found out about this baby; and He prompted them to do whatever it took to transform “abandoned” into “claimed,” “lost” into “found.” The joy of loving this baby, now an 18-year-old whom I call my son, never lets me forget for a day God’s absolute passion for what is lost. He’ll do whatever it takes. If you hang around God for long, you realize His love manifests in finding lost things. I think that’s why Jesus became so angry when the good religious people grumbled because he was hanging out with sinners. He perceived they couldn’t possibly know God if they didn’t understand his choice of companions. And He also recognized we humans just can’t wrap our brains around God’s love; it’s too fathomless, too high and wide for us to even begin to comprehend. So, He told a story about a lost sheep and a shepherd who wouldn’t give up. Not long after our family divided in our search for the greyhound, a text from our oldest son lit up our phones: I have the dog! We laughed in disbelief, pulled a U-Turn and high-tailed it to him. There he stood alongside a major six-lane street, cars whizzing by, clutching a gangly black dog. When he first glimpsed her, he called her name. She streaked the opposite direction, right into the racing traffic. Somehow, she careened safely across. When the cars cleared, our son followed and sprinted after her down the sidewalk, yelling for people ahead to grab her. Someone did. We herded our crew to the safety of a nearby parking lot. Caked in dirt and blood from light scrapes, the dog trembled with cold and fear. My son took off his jacket, wrapped it around her, and pulled her on his lap, stroking and calming her. If God’s love looks like anything, it’s this: the shepherd of Luke 15, lifting that mangy, grimy, shuddering sheep in his arms and slinging her over his shoulders. A similar scene played out that day seeing my son cradling a gaunt, bewildered greyhound who was once lost but now found. Because, you see, if you’ve met this God, you’ll start to care about lost things, too. Once you’ve tasted this love that refuses to give up when the search is on, you can’t settle for anything less. When you find yourself compelled by a higher source, join the hunt, and experience the joy of finding lost things, your heart explodes. You’ll do whatever it takes. I think of another scene. 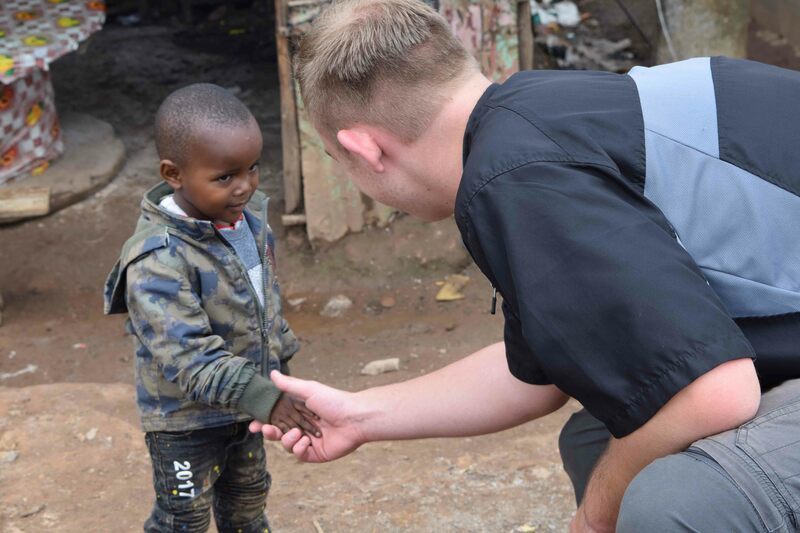 Our oldest son slips and slides down a slimy, rubbish-strewn hillside between rusty corrugated metal tin shacks, deep in a Nairobi slum where lost, abandoned and orphaned children live. He greets the ragged little kids, and they climb on him with leaky noses, urine stains, and the stench of the slum. They are grimy, sick, abandoned. But all my son sees is treasure waiting to be found. The parable worked its way into his heart, and he can settle for no less. Originally posted in the Hope’s Promise blog. how are you guys? long time no see. how is lily these days?? Oh, thank you for sharing this! What a captivating story, on so many levels. And, Amen! I needed to read this today. Will share with you more via email.. Thanks Colleen! I am blessed to know it could encourage you dear friend! Oh my goodness. I love this SO much! (How you describe God’s love, how you put it into action, how you’ve shown your children how to search and rescue those lost, and how they’ve made it their own mission to look for lost treasures. Beyond beautiful and inspiring!